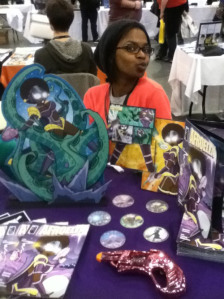 Afroella is a Glyph Award nominated comic book series from writer Gemma Bedeau and artist Lee Fenton-Wilkinson who together form the dynamic duo Kromatron Comics. Afroella is inspired by a love of 1960s sci-fi, rocket ships, robots and giant monsters then sprinkled with an appreciation for Blaxploitation and cheeky pop culture references. When the comic was first launched, we had such a positive response within small press comic publications as well as African American and minority focused comics and sci-fi publications.